You can add a GIF anywhere within your Course that contains a text editor. Step 1: Click on the ‘Image’ button (highlighted below in red) on the Toolbar at the top of the Text Editor. Step 2: Find your GIF. This can be done via Google or a site that specialises in GIFs – www.giphy.com is a great place to find relevant ones. 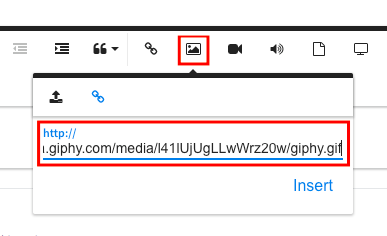 When you’ve found a GIF you like, copy its URL and paste it in the ‘URL’ field. Step 3: Your GIF will be inserted in the text box where you are able to resize and align as you require.